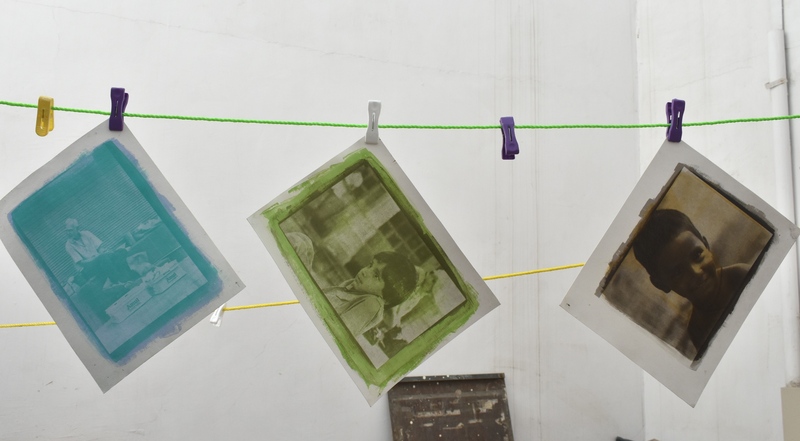 As a part of the printmaking workshop series of Jawahar Kala Kendra (JKK), a 5-day Gum Dichromate Print Making Workshop was held at the Graphic Studio. The workshop was facilitated by Mr. Arpan Mukherjee. Over 10 students learnt this rare art of printmaking. Mr. Mukherjee informed that Gum Dichromate is a 19th century process of photography printmaking. It can be said to be a part of alternate photography. Though this process is meant to print photography, it has a painterly output as the final result. This revived print making technique is mainly popular among the western artists but is slowly gaining recognition in India as well. Mr. Mukherjee also informed that during the course of five days, the participants tried their hands on Monochromatic as well as Color Photography prints. Participants learnt to process the paper and chemicals for the technique and also make digital negatives. The workshop involved the use of materials like water color paper for base, UV light exposing table, gelatin to prepare the paper, water color pigments as well Gum Acacia also known as Gum Arabic Powder or ‘Babul gum’. He further added that this technique has a major advantage — it can easily be practised at home with minimum materials since sunlight can be used to expose the paper to UV light.